Do you want to begin a new Halloween tradition in your neighborhood, and get the holiday excitement started early? Have you ever been Ghosted? 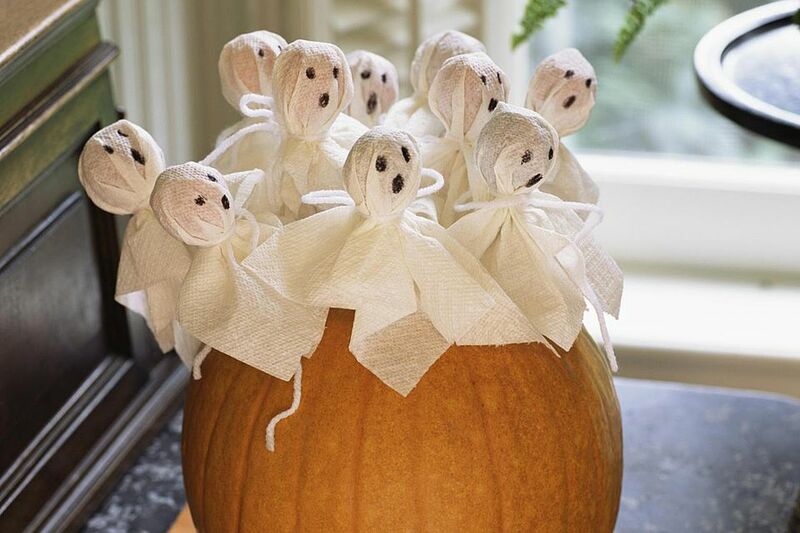 This type of ghosting is a fun way for friends, co-workers, and neighbors to spread the seasonal fun. You don't need social media to go viral as this game spreads joy and fun the old fashioned way. It's like a chain letter, but with only treats and no tricks. Ghosting should be done a week or more before Halloween. You may want to target an October 15 kickoff to give it a chance to spread through a neighborhood or a large company. Among a few friends, October 24 might be a good start. Two ghosts. You can be creative here and wrap a lollipop or treat in white cloth to make it into a ghost. Attach a string, so the person you ghost can hang it from their doorknob. Or, you can buy ghost decorations at the store and attach a string or hanger to them so they can be easily displayed on a doorknob. To make it even easier, simply print out a drawing of a ghost and cut it out, taping or gluing a string to it. Take the two paper bags and place one of the "You've Been Ghosted" letters, one ghost picture, and some candy in each bag. When it's dark, sneak over to a neighbor's house. If you are a minor, do this with an adult accompanying you. Leave the bag on their porch, ring the bell and run away. Don't let them see you. Your Ghosted neighbors will, in turn, ghost two more people. Before you know it, it will spread throughout the neighborhood. If they have an office door, you can leave the bag on their door before they arrive for the day or after they have left for the day. If they have a desk or cubicle, you can leave it on their desk instead. Now it's your turn to "ghost" two other people in your neighborhood (or office). You should "ghost" these people within two days of receiving your treat. Hang the ghost on your front door (or office door, cubicle, etc.) so that everyone can see that you have been "ghosted" and will not ghost you again. This will also let you know who you can ghost. Fill two bags with candy and treats. Copy this letter and the ghost twice. Include treats, letter, and ghost in your bag of goodies for the neighbors that you choose. After dark — and only with an adult, if you are a minor — "ghost" two of your neighbors. Do not let the person that you are "ghosting" see you, for it adds to the fun of it all. Place the treat bag on the doorstep, ring the doorbell and run! It will be fun to see how many ghosts will appear in our neighborhood by Halloween. Please keep it safe and enjoy!